The Typographic Wall Calendar is a project I am working on since 2009. Every year the calendar is made of exactly the number of used keyboard keys (2000 and 15) that represent the year. This is the 6th edition of the calendar. Items are sold and shipped from Germany. Only if your shipping address is located in the EU, Sales Tax will be added in the checkout process. You like to purchase the item or have further questions? Would you like to have a closer look at the image? You can download a high-res (1,7MB) image here. Is it a real calendar? How do you read it? Yes! It is a real, usable calendar. This typography calendar makes finding dates a fun and creative process. If you read the keys from left to right, they show each day of the year in sequence: JANUARY TUE 01 WED 02 THUR 03 etc. You can think of it like a string of all dates in the year. To make things easier, every month is marked by two arrow keys. After a bit of practice, you can orient yourself quickly within the grid. It is also possible to write directly onto the calendar. 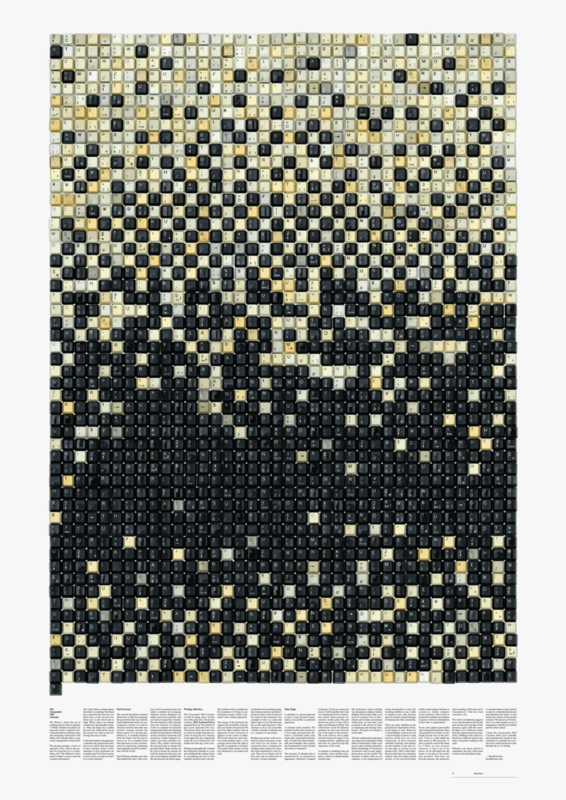 The calendar is made of two-thousand and fourteen used keyboard keys. 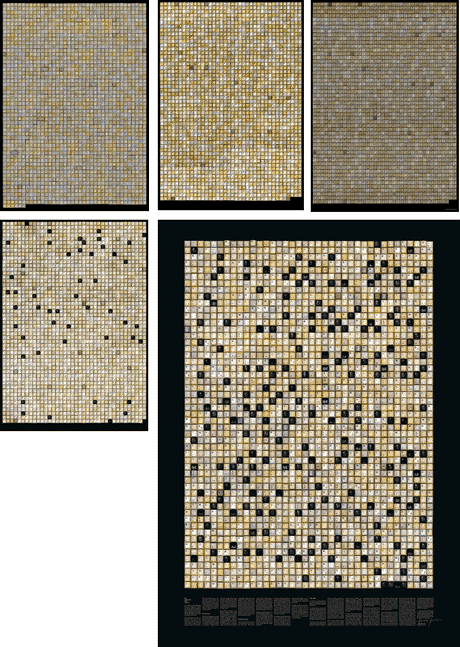 The keys are arranged manually in a grid ( 38 x 53 + 1 = 2015 keys) to write out all days of the year 2015. Do the colors of the keys follow a system? The initial idea for the Typographic Wall Calendar came from a daydream. In this dream I imagined a person in a random office typing in front of a computer. The person writes letters, for example to customers. On every letter the person writes the date, a repetitive part of the job. I imagined that as the person types, the pressed keys would (somehow) sum up or accumulate. Not only would the keys be counted but also collected, ordered and stored. Over days and weeks it would become a mountain of keys. 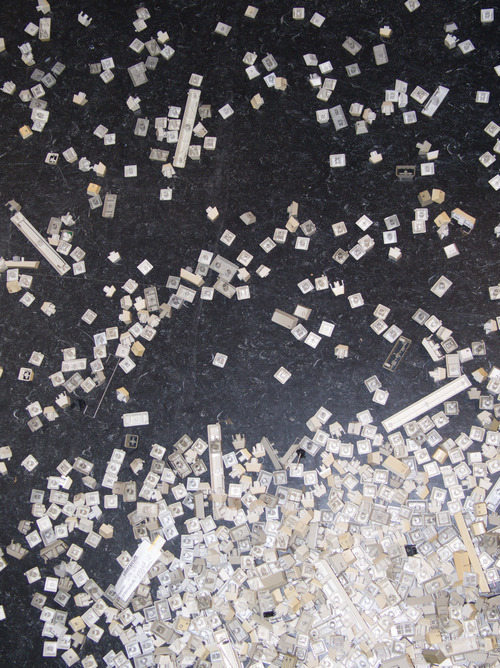 This “mountain of keys” then became the Typographic Wall Calendar. The project began in 2009 as a (very oversized) New Years card for my studio in Frankfurt, Germany. The response from friends and clients was overwhelming. People called up to say that they wanted to buy more or already framed it. In the beginning I was focusing on the idea of writing the year from beginning to end as a continuos text and to break up the common tabular structure of a calendar which divides the year in columns (months) and rows (days). I still find this a major point of the work. It shows clearly how dependent our imagination of time is to a tabular display and order. I wanted to focus on the act of writing rather than the outcome, which would be rendered text. To show the act of writing I choose to present all the keys necessary to write the year in front of you. …the writing things collaborate on our thoughts. I like the term collaborate, because it implies that we do not use the pen as a lifeless tool to express our thoughts. The pen itself is working actively on our thoughts. The computer keyboard on screen or physically in front of us is the contemporary writing implement. If and how our writing tools work on our thoughts I leave to your imagination. With this collection and vast amount of keys in front of me different thoughts arise. All around me people complain about the loss of handwriting, filled with nostalgia a friend buys a $500 Montblanc pen. 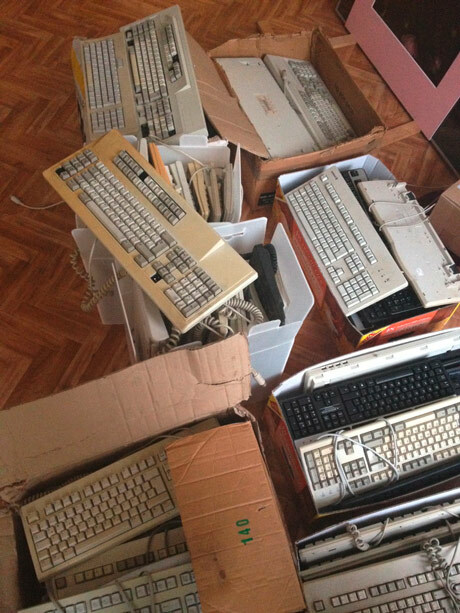 But I also noticed that other people are talking with nostalgia of old keyboards. This article on Ars Technica is about the IBM Model M that was build in the 80s, in another article from PC World the same device is praised as the world greatest keyboard. As a typographer I noticed typographic aspects that I would like to draw your attention to. In the picture above you see an Apple Keyboard with an IBM Model M behind, both are build in 1989. A small detail is the positioning of the letter. On all Personal Computer keyboards letters are placed in the upper left on the key cap. The only exception are Macintosh keyboards. 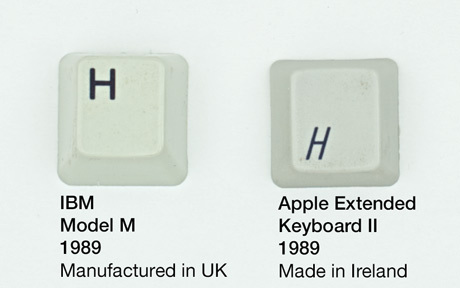 Apple placed the letter on the lower left, until 2007 with the Apple Keyboard A1243. Apple decided for a rather daynamic italic condensed sans serif typeface, whereas most other keyboard manufacturers until today prefer an extended bold and sometimes rounded sans serif. In 2007 Apple introduced their flat keyboards model A1243 which also placed the label in the center of the key with an Upright rather airy geometric sans serif typeface. To me there is no argument for a design decision to place the label in the lower or the upper left. Once hands are placed on a keyboard the keys become invisible but tangible. That is why the little nobs on the J and F are so important to me. I like the placement of the letter in the center, it makes the device less complex and reminds me of old typewriters, where the keys had round caps with beautiful slab serif letters on it. 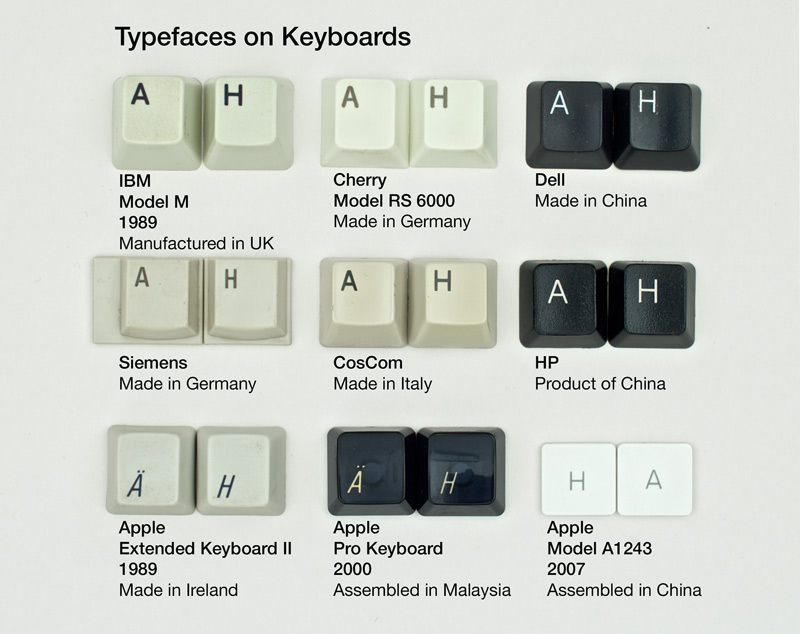 Here is an overview of different keys with different Typefaces on them. But also major changes in society are reflected in keyboard design. On the first day of January in 2002 the Euro currency was introduced. 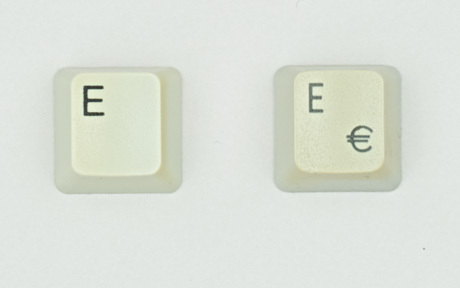 After 1999 keyboard manufacturers started to print a € sign next to the E key. 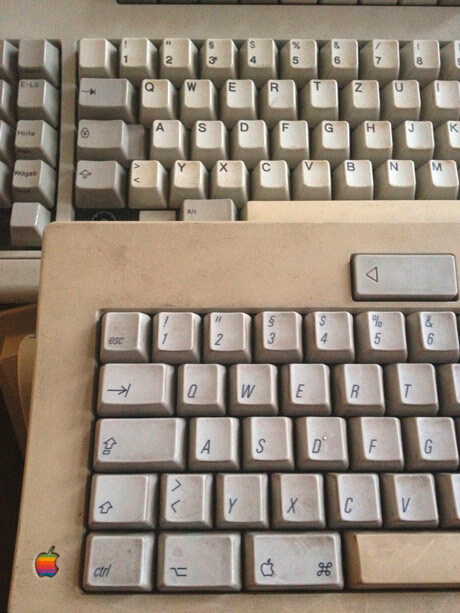 This makes it easy to spot the age of a european keyboard. All calendars ship from Germany. Shipping costs are calculated based on your location. The calendars will be send in a strong protective poster tube (112cm long – 7.5 cm diameter). Top and bottom end of the tube are filled with bubble wrap to cushion the prints. 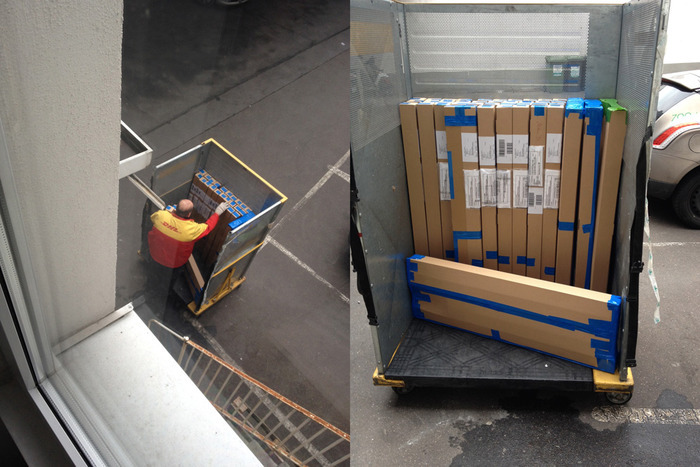 The poster tube is then packaged in a protective rectangular box to make shipping and handling easier. All shipments that include the Typographic Wall Calendar are trackable online and covered by insurance. After the calendars are sent out you will receive an email from DHL with the tracking information and status information. So far the Typographic Wall Calendar has been shipped to 41 countries around the globe: Argentina, Australia, Austria, Belgium, Brazil, Canada, Croatia, Denmark, Estonia, Finland, France, Germany, Greece, Hong Kong, Iceland, India, Indonesia, Ireland, Israel, Italy, Japan, Korea, Liechtenstein, Luxembourg, Malaysia, Mexico, Netherlands, New Zealand, Norway, Portugal, Russia, Saudi Arabia, Singapore, South Africa, Spain, Sweden, Switzerland, Taiwan, Thailand, United Arab Emirates, United States of America. 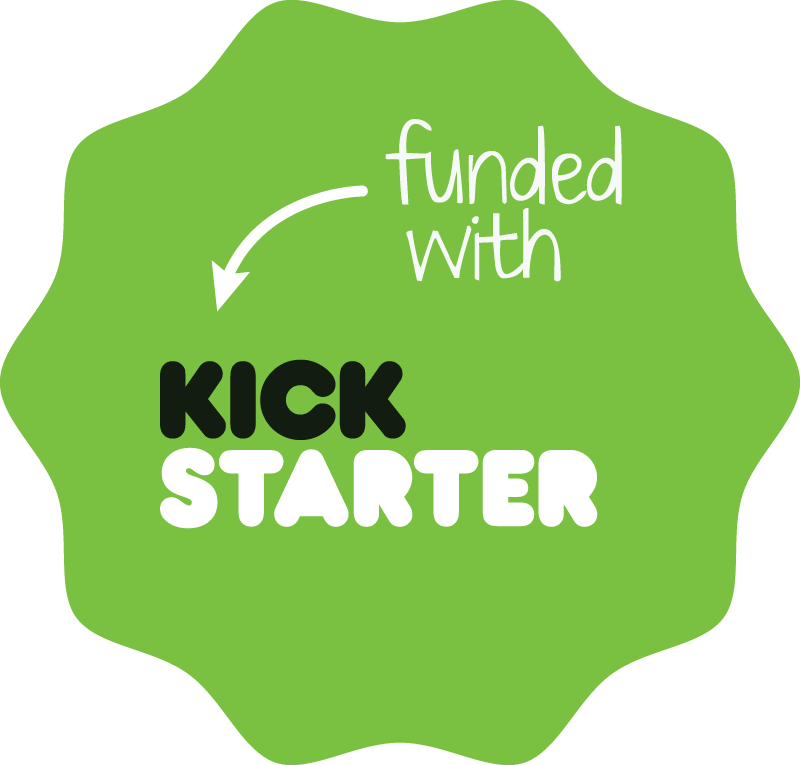 After producing the first edition in 2009 for 2010 on my own, in 2010 the project became a Kickstarter campaign to upfront production costs. The response was very positive. After a successful campaign with 205% funding, over 90 calendars were shipped to people all over the globe. In 2011 the 3rd Edition of the Typographic Wall Calendar received an overwhelming funding of $18,089 from 428 international Backers. In 2012 (4th Ed.) 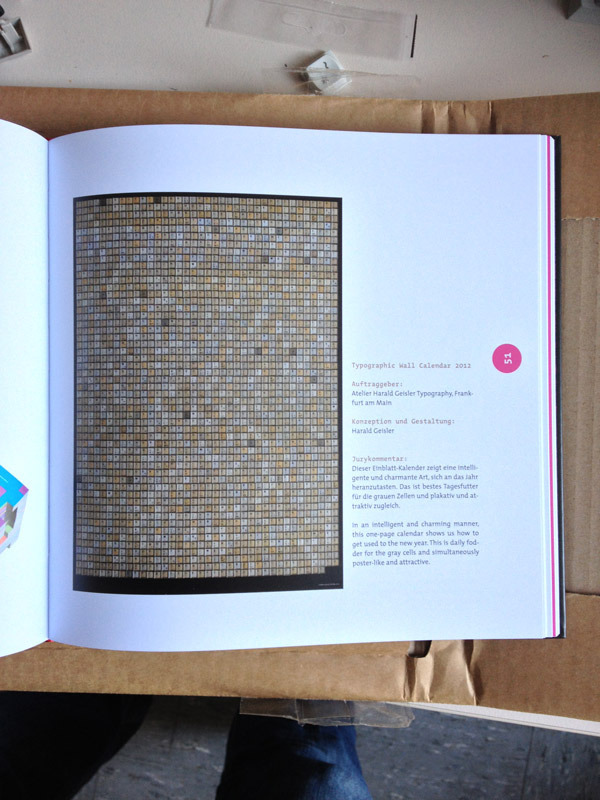 and 2013 (5th Edition) the Typographic Wall Calendar was also successfully funded through Kickstarter. 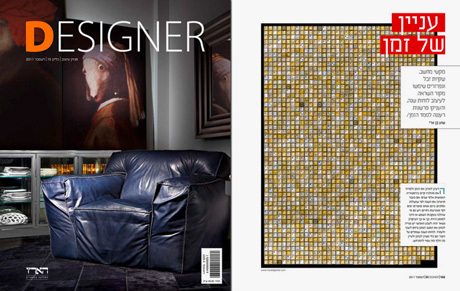 The Typographic Wall Calendar was an ‘Editors Pick’ at GQ Germany, featured on Fab.com and reviewed in ‘DESIGNER‘ an Art/Design magazine from Tel Aviv! I always wanted my work to be featured in the Italian Vogue. I never thought of being featured in a feminist and social justice magazine from Chicago! In Broad #70 “Tech Cell-fie” (p.38) between articles on the Future is Queer, Medicine and Gender, Cyborgs, GMOs, Fahrenheit 451 and quotes from Einstein (really!). Who wouldn’t want that? And does this say something about me? In January 2012 the Typographic Wall Calendar won the Gregor International Calendar Award in Stuttgart. Yes, there are awards especially for calendars in Stuttgart. 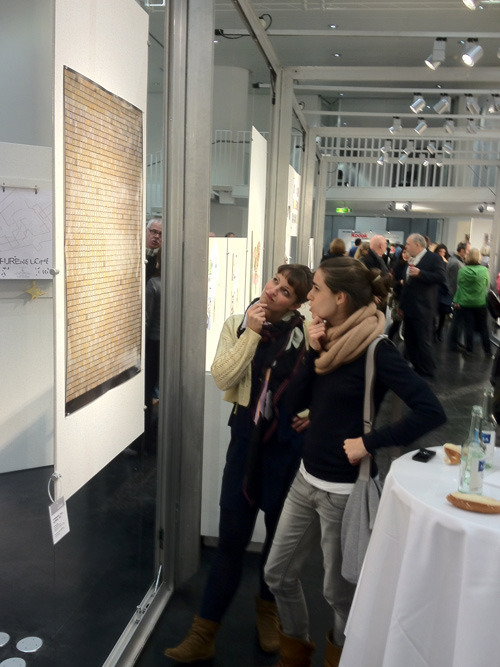 The Typographic Wall Calendar on display at the Gregor Award in Stuttgart(picture right). What is that text at the bottom of the Poster? 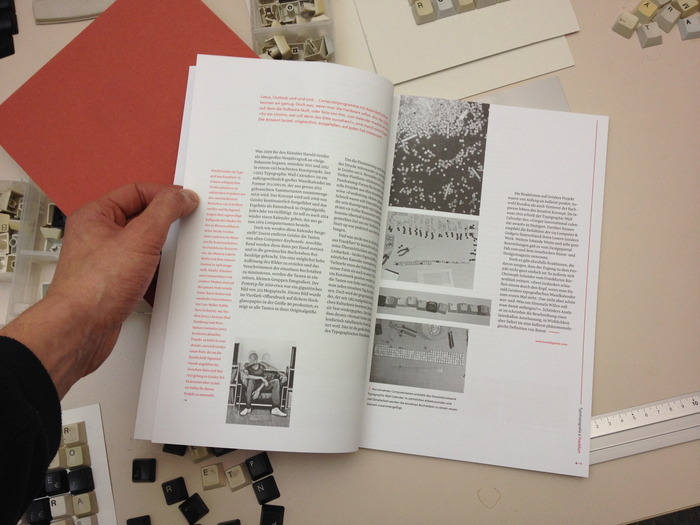 The text bellow the image is about the work. The Work is about the act of notating time in order to organize it. While calendars nowadays are typically used to optimize per-sonal potential by marking events and managing interaction with others, this calendar offers a view on the management of time itself. The design prompts a series of questions. First, what is the picture? Is it just keys or is it some-thing else? The different colors seem to follow a secret code that contains information. Is that information reimagined as a calendar, the question becomes how to act with it. Does the usage of this calendar relate to how calendars or how keyboards are normally used? Do I have to press a series of keys to mark an event? Is it a time machine? The ancient Egyptians oriented themselves in time by imagining the past before their eyes and the future behind their backs. In contemporary culture we tend to structure ourselves the other way around, looking towards the future ahead of us and the past behind us. A calendar displays both the future and the past in front of us. It is a notation form that functions as a tool, an instrument for organizing, managing and imagining oneself in interaction with the world. Early Western calendars were lists that marked holy days. They were not a tool for measuring time, but rather a medium for arranging religious actions. Religious calendars were used cyclically, read over and over again like a mantra. The development of the calendar from the notation of religious events to a premise for personal management reflects the changing position of individuals in Western society and their increasing self awareness. Unlike religious calendars, personal calendars are linear. They enable referencing the personal past to design the personal future. Both systems can be used to locate the present. In both the future becomes past, but only in the religious calendar does the past become the future again. The Typographic Wall Calendar is both an image and a written text at the same time. 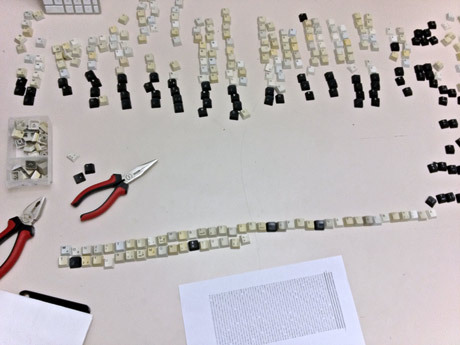 The picture contains 2015 used keyboard keys arranged like text. The number of keys used, represents the year. 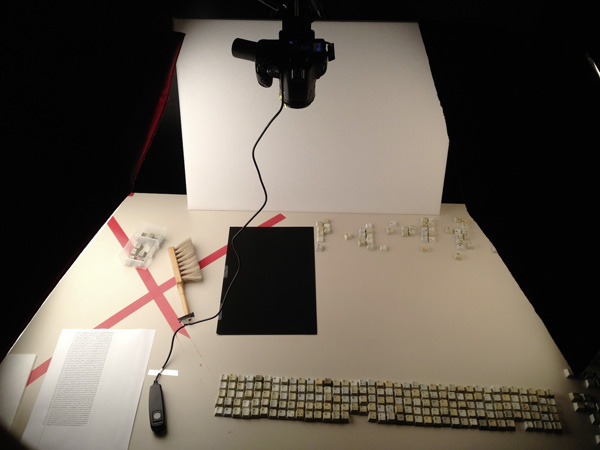 The picture shows the tools used to create text rather than the outcome of using the tool. Starting in the upper left, the composition reads the year followed by the month and each day of the year. Working typographically, I treated the Gregorian calendar as a text and considered the writing of time by assembling the keys of this calendar dictation into a picture. The medium of keys emphasizes the treatment of writing in contemporary society, where a keyboard is the writing implement. The image of the keyboard key suggests the possibility of action. Keys are meant to be pressed. We press the button labeled with an uppercase B and a lowercase b appears on the screen or paper. We hit the return key and a process in the machine starts i.e. the carriage moves from the right to the left or a program is executed. The results of key actions, not the keys themselves, are meant to be read. I remember from learning typing, that I memorized how each letter’s position relates to the location of my hand on the keyboard. For example to write a g, I move the index finger of my left hand one key to the right and press. This memory to me is not accessible verbally, textually or literally, but as a memory of movement. Reading the picture with movement in mind, it becomes a notation form for two hands. An instruction that is imaging the reading of the writing of a calendar from beginning to end of a year. Then it is no longer a list of holy days but an instruction to recreate a written calendar. A calendar is a special approach to time. A map structures space, makes it accessible to particular operations. A calendar works similarly. The structure divides time into pieces, it sets marks and generates distances. Calendars make time frame able, measurable and tradable. It makes the future predictable and evaluable. How could a day be planned if it wasn’t divided into hours or daytimes? The structure of calendar time is manifested by its geometrical appearance. Duration is mapped to distance. Events are expressed in area. I still remember how time was constructed for me in elementary school. Each semester we created a weekly plan. The grid moved one unit at a time, left to right, from Monday to Friday. The school hours (each 45 minutes) spanned one unit each, from the top of the paper to the bottom. The week went by, left to right, and then started over again. It was a strange outcome: quadrants and intervals in a special map-like experience of the week. A calendar is modeling time not accurately; each calendar transports a vision or a cultural attitude towards time. My elementary school calendar was designed according to tabular thinking. Historically tables were used to compare lists of information and to make calculations within lists. As such they were essential to the advent of trade, to organizing and running ware- houses. The ghost of calculus is in the table. All basic mathematical operations are connected to operations within tables of information. Tables were used to gain trading potentials. Better knowledge of warehouse inventories lead to more appropriate prices on the market. The structure of tables refers to calculation, to the organization of goods, merchandise or wares. By teaching children to use a table to organize time, they become part of a modern cultural heritage of treating time like commodity. There are many subtleties in the geometrical visualization of time, in the design of time. When ten o’clock Monday is put next to ten o’clock Tuesday it creates a visual relation which does not exist temporally. In most common calendars Saturday and Sunday are put together as one unit (i.e. on one page or section of one business day). Why is that done? Because these days are commonly without value for trading related actions, or are not processable within a trade related structure or system (i.e. family, religion, social relations). But if time is treated like tradable merchandise or goods, is that not contradictory to how time is experienced? To me, time appears perceivable only in the present moment. Plans and prediction of future events might become true in the presence. To do so, a plan makes me take action in the presence, to force a specific event in the future I.e. I better go now, because tomorrow I want to be at the beach. So far and until now the future is not part of, but points into presence. Past does not become present, but memories and recordings of the past can be remembered. I like the word remember a lot. The word re-membering suggests to me, that through an activity the past can become a member of the presence again. Still this membership is of a different nature than the original and actual experience. Walking in the sand on a beach has a different value to me, than to remember walking in the sand. Whether one plans ahead or remembers the past, both relate to direct and immediate being. A calendar helps to align oneself in time by remembering the past and planning the future, to put both in the context of the present moment. The process of orientation is for some people an act of imagination with the past behind and the future ahead. I hope this Typographic Wall Calendar offers you a valuable and inspirational insight to the construct of a calendar, an everyday tool to mark and process time through the act of writing.